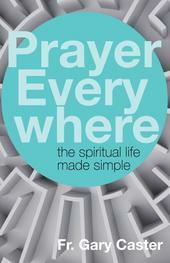 Enter Father Gary Caster’s book, Prayer Everywhere (which was obviously sent to me by the Holy Spirit). Through his simple suggestions and wonderfully entertaining anecdotes, I was reminded about the simplicity of prayer which I’d forgotten. Devotions aside, prayer is ultimately about our relationship with Jesus and it need not be complicated. Father Caster’s chapters are relatively short making it easy for a quick read here and there if you are very busy, but each chapter is filled with reminders of how simple it is to incorporate prayer into our daily lives. His chapters focus on setting up your day for prayer and reminding us of what prayer is. He reminds us of ways we can speak with Jesus, of ways we can use scripture, and the ways the sacraments lead us to prayer. This book is so practical, but the greatest parts are when he includes his personal stories. They add to his teaching and make it seem so much more simple to have that relationship with God. My favorite story was one he told about his parents. Their love for each other was amazing until their dying day. I love his view of their death and the story left me in tears. Father Caster has a gift for teaching. His book was a joy to read and helped this mama in a “prayer rut” feel a sense of peace when I finished reading. I’d love to read more from Father Caster (you can see some of his other books below) and I hope lots of people can get their hands on this book. I was given this book by Franciscan Media in exchange for an honest review. Create a space that is dedicated to prayer in your home. Make sure you have a designated time to pray each day. You can use all of the great ideas from Lacy at Catholic Icing here!